If you want to know what functional foods are, why people eat them, and which are and aren’t worth working into your diet, you want to listen to this podcast. Typically, “functional foods” are those that can provide additional health benefits beyond fulfilling basic nutritional needs. For example, fatty, cold-water fish like salmon, mackerel, and sardines contain omega-3 fats, which can positively impact your health and wellbeing in a number of ways. Colorful fruits and vegetables like broccoli, berries, and Brussels sprouts are another good example. They contain plenty of vitamins, minerals, and fiber, but also other goodies like sulforaphane, anthocyanins, and carotenoids that can reduce the risk of disease, support brain, eye, and heart health, and more. And even much-maligned foods like beef, pork, and lamb contain a special type of fat, conjugated linoleic acid (CLA), that’s associated with a reduced the risk of type 2 diabetes and cancer (and grass-finished/fed meat are particularly rich in CLA). All this is why food and supplement marketers have seized on these types of foods and molecules and spent who-knows-how-many millions of dollars over the last decades promoting their purported wonders. For example, several well-known wellness gurus are trying to make sulforaphane out to be the natural cure for cancer, when it’s far from a magic bullet. Omega-3 fats are important, but they can’t bulletproof you against heart disease as some people claim. And while CLA has some health properties, it’s hard to quantify how helpful it really is for the average healthy person. So, my point is while some foods are more nutritionally “special” than others and deserve consideration in your meal planning, most aren’t as helpful or vital as many self-styled diet experts would have you believe. 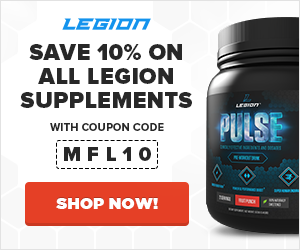 And that’s why I wanted to get Kurtis Frank, the director of Research and Development for my supplement company Legion Athletics, onto the show to break down the real science of functional foods. 7:49 – What are functional foods? 10:31 – What are the health benefits of fish? 11:39 – What type of fish are good for omega-3 fatty acids? 14:25 – What are the good molecules in broccoli? 16:21 – Is there a physiological difference between eating broccoli regularly versus supplementing? 17:26 – How many servings of fish do you need every week to meet a proper dosage of omega-3 fatty acids? 20:40 – How many servings of fish do you need to balance omega-6 intake? 21:36 – Is salmon good for omega-3 fatty acids? 22:28 – Do plant-based people have to worry about balancing their omega-6 intake? 23:21 – If you need high intakes of omega-3s, can you achieve it from food or do you need to supplement? 24:05 – What dosage of omega-3s do you recommend to reduce muscle soreness? 25:15 – How many grams of EPA and DHA do you need for brain boosting? 26:18 – Which foods are marketed as functional foods but are not functional foods? 26:49 – Is there another cruciferous vegetable that has the same health benefits of broccoli? 27:57 – Do you have a lot of variety in your diet or do you like the same foods? 29:03 – Is chlorella a functional food? 32:18 – Are jackfruit and moringa oleifera functional foods? 35:41 – Is kale a functional food? 38:24 – Is garlic a functional food? 40:00 – What’s in garlic? 42:01 – How much garlic should you eat to gain its health benefits? 43:10 – Does cooking garlic alter its health benefits? 46:36 – Which spices are functional foods? 47:16 – Are blueberries a functional food? 47:25 – Do frozen blueberries have better health benefits than fresh blueberries? 48:51 – What are the health benefits of blueberries? 53:19 – Are cranberries a functional food? 55:02 – Is rosemary a functional food? 55:48 – What are the health benefits of rosemary? 56:24 – Which food has the most rosmarinic acid? 58:10 – Is coffee a functional food? 1:00:13 – Is bitter cucumber a functional food?